Erongo’s Sandwich Harbour lies 80km south of Walvis Bay along a rough-hewn track which is best attempted with the help of a 4×4 vehicle. It is about 400km from Windhoek and 46km from Swakopmund. At one time Sandwich Harbour was attractive to ships and boats as a minor destination for whaling and fishing. Now it is best-known for the birds which congregate around the shallow lagoon at its southern tip. In the north, beyond the beach ridges, swales and salt pans separating it from the lagoon, Sandwich Bay spills out into the ocean. Beyond that, the Namib Desert stretches off to the horizon. Sandwich Harbour was initially surveyed by the Royal Navy with the objective of setting up a formal port. However, this never took off due to its proximity to Walvis Bay. During the 1930s, sand was pumped into the lagoon from the surrounding desert with a view to establishing a guano island. While the birdlife certainly came to the party in this regard, marauding jackals soon discovered how to make their way to the island at low tide, and scared them off the production line. With no commercial future in sight, Sandwich Harbour was incorporated into the Namib-Naukluft National Park. Later surveys by the South African Museum and the National Museum of Namibia revealed that only marine fauna now remain in the area. As a result, the birds have returned to their island and the reed beds surrounding the lagoon in their thousands. This abundance has won the lagoon at Sandwich Harbour the title ‘Wetland of International Importance’ and earning it the attention of internationally-renowned ornithologists. Research by these experts has revealed numbers of flamingos to rival those of Etosha National Park, and record numbers of plovers and terns in the area between Walvis Bay and Sandwich Harbour. Pelicans, turnstones, avocets and other waders also visit here, with the numbers peaking at about 170 000 during November. A little further afield, Dune lark and Damara tern tiptoe amongst the sands. 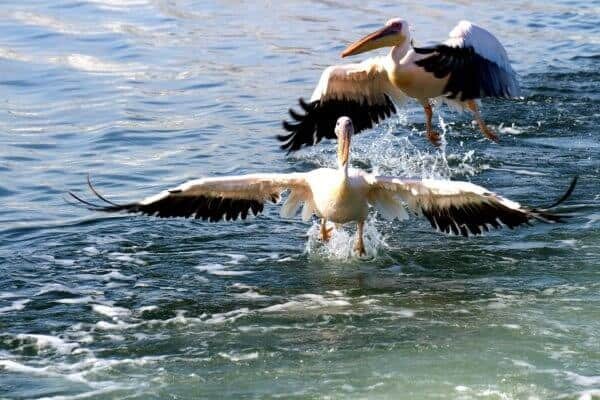 This rich birdlife is best experienced on a guided or self-drive trip from Swakopmund. The route crisscrosses the dunes and the old railway line to Walvis Bay, where you can marvel at Bird Rock, which is home to over 200 000 water birds. The next site on the agenda is the Kuiseb Delta with its ancient Khoi sites, fossilised animal tracks and towering dunes. Traversing further across the salt pans and sands you may spot ostrich, jackal, springbok, jackal and brown hyena as well as Pale Chanting Goshawks. Peregrine Falcons and Black-breasted snake eagles search from high for small mammals and reptiles in the sands. Miles of rough terrain follow, only to reveal an unexpected abundance as you reach your destination. The wetland vegetation is a lush contrast to the sandy route you took to get here, with only one deserted building sticking out of the landscape and the lagoon with its 40 000 avian inhabitants. It’s the perfect spot for a picnic with binoculars and bird list close to hand. A walk along the oceanfront may reveal seals, whales and dolphins offshore, should you tire of the head-spinning variety of birds. The guided tours depart well before sunset to arrive in Swakopmund before 5pm and self-drivers should make sure they have enough time to exit the National Park before closing time. Sandwich Harbour is yet another example of the unexpected abundance and beauty to be found in this interesting country and well worth including in your trip to Namibia.